DOYLESTOWN, Pa. (WPVI) -- An unlicensed, intoxicated driver who killed at 68-year-old Doylestown woman in a head-on crash while fleeing the scene of another crash was sentenced Monday. Joseph Mancinelli, Jr., 25, of Warrington, pleaded guilty to charges including third-degree murder and homicide by vehicle while driving under the influence in the March 23 death of Patricia MacAllister. 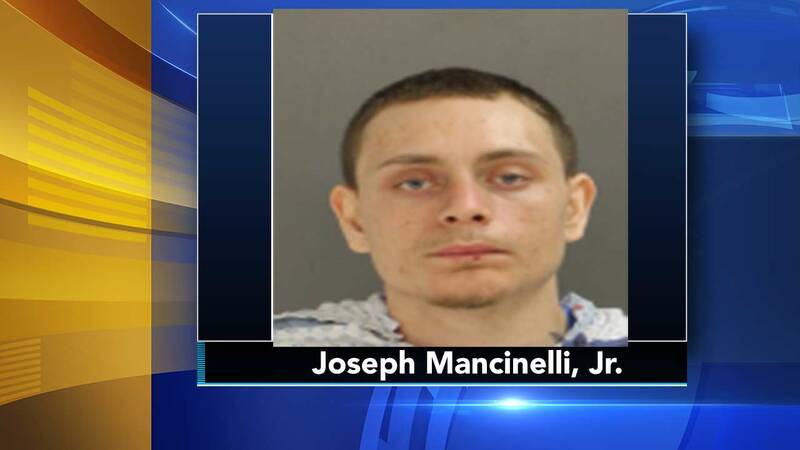 Mancinelli was sentenced to serve eight to 20 years in state prison by Judge Jeffery Finley, who accepted the terms of a plea agreement proffered by the Bucks County District Attorney's Office and Mancinelli's public defender. MacAllister was reportedly driving home from the grocery store on Sandy Ridge Road in Doylestown Township when a speeding Chrysler sedan driven by Mancinelli crashed head-on into her Hyundai sedan. Officials said she died of blunt-force chest injuries suffered in the collision. Mancinelli did not have a valid driver's license at the time of the crash and was impaired by oxycodone and methamphetamine when the late-afternoon crash occurred. Officials said he was attempting to pass an SUV illegally across a double-yellow line when he pulled into the path of MacAllister's oncoming car. Police said minutes earlier Mancinelli had rear-ended another woman's car near Doylestown Hospital. The second crash occurred moments later; witnesses told police Mancinelli never slowed or braked before hitting MacAllister's car, and then stumbled away from the wreckage without checking on her. Witnesses said he discarded his keychain near a bike path across the street from the accident scene. Police later found oxycodone pills and methamphetamine inside a small canister attached to the keychain. Mancinelli apologized to MacAllister's family saying: "My heart goes out, I think about it every day. I feel terrible." The case was investigated by the Doylestown Township Police Department and members of the Bucks County Crash Investigation Task Force and was prosecuted by Deputy District Attorney Robert D. James and Assistant District Attorney Jovin Jose.